Power Systems Protective Device Coordination Part 6. 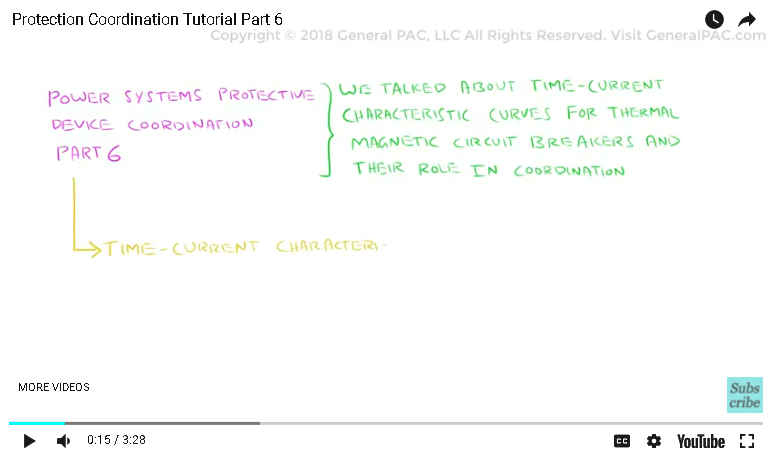 In part 5, we talked about the “time current characteristic curves” for thermal magnetic circuit breakers and their role in coordination. In part 6, we will be discussing the time-current characteristic curves of “Electronic Trip Units” and learn how they can help us achieve better coordination. For this electronic trip unit, there is a long-time region which starts from the pickup amp value. This region includes the protection against overloads and the pickup starts from 110 to 120 percent of the amp rating. There is an adjustable time delay, after which, it enters the short time region. Short time region is used to define another adjustable pickup value, along with an additional delay of a few seconds, in order to ensure better coordination with downstream devices. And finally, we have the instantaneous region which includes tripping time of a few cycles. Both the short time, and instantaneous regions are for protection against high fault currents. In order to better understand the concept of short time, let us recall the time current curves which were demonstrated in part 5. One of the highlights was a flaw in the instantaneous region of the curves, which were overlapping after a certain current level, resulting in both the Breakers tripping simultaneously. Let’s say this level is at 10,000 Amps. What this means, is that we would want Breaker “C” to trip first, for all fault levels at 10,000 Amps and below. 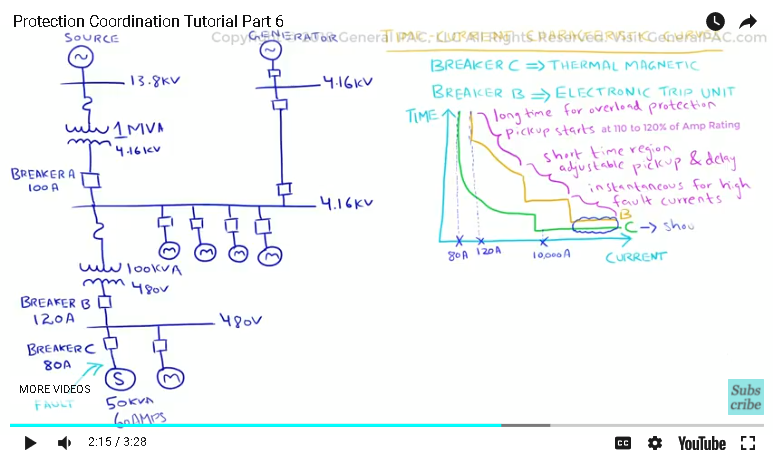 We would only want Breaker “B” to trip in the case of an operation failure of Breaker “C”, or in the case of a fault level which is greater than 10,000 Amps. This is where the short time region comes into play, we will use this region to define an additional delay time of a few seconds which would prevent it from tripping simultaneously with Breaker “C”. As we can see, Breaker “B” will now include a small delay for fault levels up-to 10,000 Amps, ensuring coordination with Breaker “C”. Breaker “B” will trip instantaneously for fault currents much greater than 10,000 Amps. This makes sense, because the maximum fault level at the Breaker “B” terminals would be greater than 10,000 Amps. 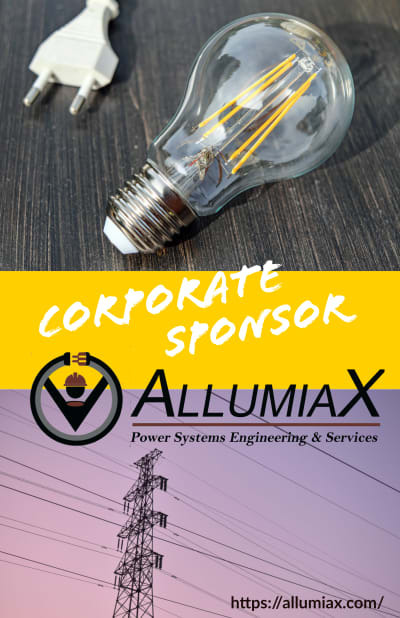 This is one of the best ways of achieving protection coordination using inverse time characteristics and the breaker amp ratings. 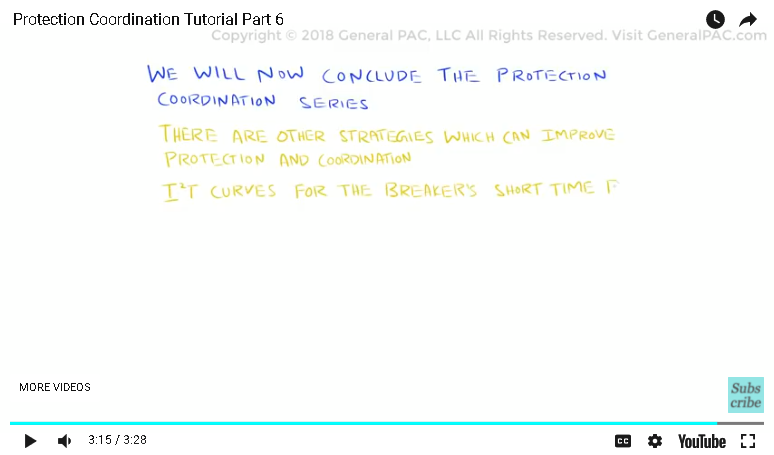 We will now conclude the protection coordination series. If you found this video helpful, please consider liking and subscribing to GeneralPAC.com. Thank you.